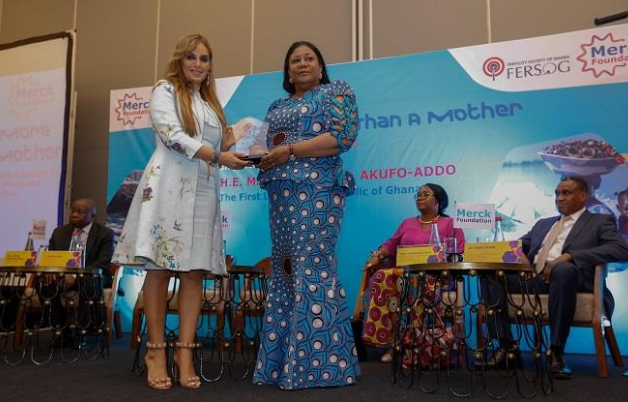 ACCRA, Ghana – Merck Foundation, the philanthropic arm of Merck KGaA Germany announces the Call for Application of ‘Merck More Than a Mother’ Fashion Awards in partnership with H.E. REBECCA AKUFO-ADDO, the First Lady of Ghana, together with Accra Technical Institute and College of Creative Design. “No designer has ever, or would ever; say that he or she wanted to make things difficult for women. Fashion industry has already got enough flakes for being superficial. Let’s change this perception and create a meaningful fashion trend aiming to educate our communities that ‘Fertility is a Shared Responsibility’. I love fashion and I strongly believe that we will be able to select a creative design or designs that Men and/or Women would be proud to wear to show their contribution toward breaking the infertility stigma in their communities, villages, cities, across Africa and the rest of the world” emphasized Dr. Rasha Kelej, CEO of Merck Foundation and President of Merck More Than a Mother. The Foundation has been empowering many infertile women in Ghana by building a productive life for them by setting up businesses of their choice for them, as women are much more than just mothers. It has also provided technical training to four candidates from Ghana under their ‘Merck Africa Embryology Training Program’ to help build capacity in the field of infertility in the country. The program will be scaled up under the umbrella of the long term partnership with the First Lady of Ghana. About ‘Merck More Than a Mother’ campaign.